When the Israeli Prime Minister went to Washington, the Israeli President traveled to Rome to meet “His Holiness”. Shimon Peres seeks the blessings of the Pope. Look at their handshake. The classical greetings of two freemasons. The Israel President Shimon Peres is a freemason, knighted by the Queen of England, the former Colonial head of “Palestine”. In 2008, the Queen made Peres a “honourary Knight Commanders in the Order of St Michael and St George”. 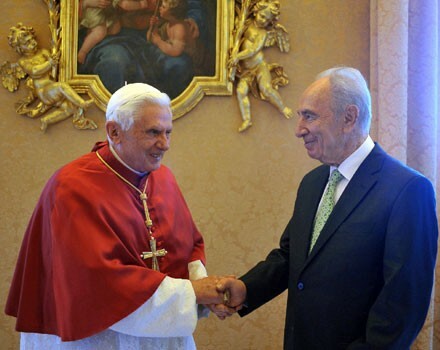 Peres is also closely connected to the Vatican, and embraces the pope as “His holiness”. 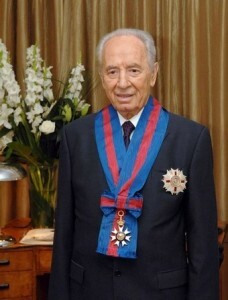 Shimon Peres was knighted by the Queen of England in 2008. What did Peres and the pope talk about? The topic was the future of the Old city of Jerusalem. Peres chat with the pontiff was well coordinated with his Labor party fellow Ehud Barak’s offer to Mahmoud Abbas: “Lets both hand over the Temple Mount to a special regime”. This is like music in the ears of the pope, who long to set up his throne inside the “Holy basin”. You should pay some attention to how freemasons greet each other when they shake hands. Because they are ordered to put a tomb, outside of the hand of a higher Commander. That both Tony Blair and Shimon Peres use the same odd handshake when they greet the pope, is not a funny coincidence. This is the way high commanders among the freemasons greet each other. 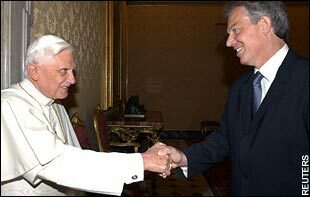 While we know that Tony Blair has become a Papist. It should be rather shocking for Israeli citizens that their own president also takes his orders from the head of the Vatican. First published: September 8th, 2010. I can hardly stand to see the years that Israel is fooled by lies and will bring more trouble too. Pray for the Peace of Jerusalem and the people ..stand with them….I see the L-rd is bring them back from all the world and one day their eyes will open to truth. that is happening too..I just can’t help but know and look forward to when Yeshua comes and HE says when He stands on the Mt of Olive , HE will bring up the dead and the living to will bow to HIM and that He will save them because of HIS NAME Sake and HIS everylasting covenants and ALL Israel will be saved as HE said HE is coming with Salvation for them..what a day that will be..